When I was in my early teens, I got my first video camera. In addition to it being nearly attached to my eye socket for the next several family functions which I taped complete with ceaseless commentary, being a film geek, my brother and I decided to recruit a good friend and make our very own movie. Oblivious to the fact that there was a Kevin Costner film of the same name, we called our small three person endeavor No Way Out with all of us playing several roles in our story of a journalist (me) who brings down her corrupt boss Alfoncis Rinetti (my best friend Paul) who, of course, had ties to the mob. While Paul and I used my Macintosh to hammer out the script which cribbed a little too much from Scorsese’s playbook, my older brother decided that direction was for him and thoroughly enjoyed bossing us around, shouting "cut" and demanding reshoots every time our small puppy ran in and out of shots. Needless to say, while it wasn’t our last grand scheme, making a film helmed by your brother is hard and for the better of our relationship, we decided to stick with video games, basketball, and super soaker fights and leave the filmmaking to the pros. In 2007, a far more professional endeavor was undertaken with Academy Award winning screenwriter turned hit movie star Ben Affleck when, in adapting Dennis Lehane’s Gone Baby Gone, he decided not only to step behind the camera to direct but cast his younger brother Casey Affleck as the male lead. When I first began seeing notes about the film in magazines, I kept having flashbacks to my suburban teenage mob movie and my heart went out to both Casey and Ben. However, after recently viewing the film that was just released on DVD last week, I realized that my concern wasn’t warranted in the least and that with two talented veterans like the duo Affleck, they ignored any family squabbling to surpass simply rising to the challenge but, in a year overcrowded with dark films, made a minor, overlooked masterpiece in the process. Thematically similar to his novel Mystic River which in itself was made into a brilliant film from director Clint Eastwood four years ago, Gone Baby Gone is Lehane’s fourth tale involving private investigators Patrick Kenzie and Angie Gennaro as the Dorchester, Massachusetts couple is hired to look into the kidnapping of four year old Amanda McCready who vanished from her home a few days earlier. Although Angie (Michelle Monaghan) was reluctant to take a case that in all likelihood would only lead to devastating heartbreak, she and Patrick (Casey Affleck) find themselves drawn in by Amanda’s devoted aunt (Amy Madigan) and use their knowledge of the tough, lower class neighborhood to track down figures and clues of which the police may not be privileged to find. Discovering that Amanda’s promiscuous and substance abusing irresponsible mother Helene (Oscar nominated Amy Ryan), who may have a few dark secrets, and has double crossed some of the neighborhood’s most notorious thugs, Patrick and Angie find that they’ve just scratched the surface of something much more complicated going on even though the police led by Captain Jack Doyle (Morgan Freeman), and Detectives Remy Bressant (Ed Harris) and Nick Poole (John Ashton) fear that they will jeopardize not only the investigation but Amanda’s life as well. However, audiences quickly ascertain that the film is more than thankfully just a gritty kidnapping drama and in the tradition of other works by Lehane, asks some deeply existential and ethical questions as it continues with a conclusion that will have viewers debating it amongst themselves for days, not to mention annoyed that they had overlooked some previous seemingly inconsequential lines of dialogue or visual cues that turned out to be vital clues as the story progressed. While most of the talk surrounding the film centers on Ryan’s convincing portrayal and dead-on accent which even fooled Boston native Ben Affleck in the audition who took her as a fellow resident (IMDb), to me, the most passionate and involving turn was by Ed Harris who tears into his role and challenges all those who share a scene with him throughout the film. 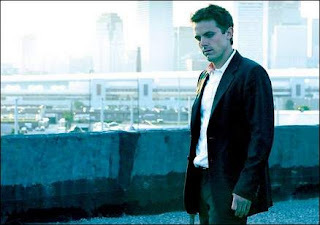 However, down the road, I think Gone Baby Gone will be remembered alongside 07’s Assassination of Jesse James... with kick-starting the career of talented character actor Casey Affleck whose versatility continues to astonish audiences and I’m sure impressed the man in the director’s chair, his big brother Ben as well.